Pavlova (Pav) is a meringue cake that has a light and delicate crisp crust and a soft sweet marshmallow center. This lovely dessert is typically served with softly whipped cream and fresh fruit. There is a long standing debate about whether New Zealand or Australia invented this dessert, which has yet to be resolved. What we do know is that the name, Pavlova, was chosen in honor of the Russian ballerina, Anna Pavlova, who toured both New Zealand and Australia in 1926. A Pavlova is a meringue, and it is important when making any meringue that the egg whites reach maximum volume, so make sure your mixing bowl and whisk are clean and free of grease. Since we need just the whites of the eggs, the eggs will need to be separated. It is easier to do this while the eggs are still cold. Once separated, cover the egg whites and let them come to room temperature before using (about 30 minutes). Cover and refrigerate the egg yolks for another use. I like to use superfine sugar (castor) when making this meringue as it dissolves faster into the egg whites than regular granulated white sugar. You can make your own by processing 1 cup (200 grams) granulated white sugar in your food processor until very fine, about 30 - 60 seconds. Australian Stephanie Alexander in her excellent book "The Cook's Companion" gives us a few pointers on how to tell a good Pavlova, "if syrupy droplets form on the surface of the meringue, you'll know you have overcooked it; liquid oozing from the meringue is a sign of undercooking". So it is best to cook the meringue in a slow oven and then to turn off the oven and let it cool slowly. The Pavlova can be made several days in advance of serving, if it is stored in a cool dry place, in an airtight container. 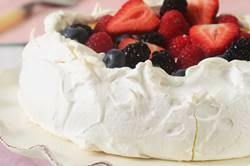 A Pavlova is usually served with softly whipped cream and fresh fruit. (For a lower fat dessert, instead of whipped cream, try serving the Pavlova with a sorbet or fruit sauce (Raspberry, Blueberry, or Strawberry would be nice) and fresh fruit.) Because of the sweetness of the meringue I like to offset the sweetness with tart flavored fruits. Passion fruit, kiwi, blackberries, blueberries, and raspberries are some of my personal favorites. Try to place the whipped cream and fruit on the meringue shortly before serving as the Pavlova will immediately start to soften and break down from the moisture of the cream and fruit. Pavlova: Preheat oven to 250 degrees F (130 degrees C) and place rack in center of oven. Line a baking sheet with parchment paper and draw a 7 inch (18 cm) circle on the paper. Turn the parchment paper over so the circle is on the reverse side. Just before serving gently place the meringue onto a serving plate. Whip the cream in your electric mixer, with the whisk attachment, until soft peaks form. Sweeten with the sugar and vanilla and then mound the softly whipped cream into the center of the meringue. Arrange the fruit randomly, or in a decorative pattern, on top of the cream. Serve immediately as this dessert does not hold for more than a few hours. The Australian Women's Weekly "Sweet Old-fashioned Favourites"
Berry, Mary. "Mary Berry's Desserts and Confections". Dorling Kindersley Publishers Ltd. London: 1991. Lawson, Nigella. "How to be a Domestic Goddess". Hyperion. New York: 2001. Maree, Aaron. "100 Fabulous Cakes and Tortes". Harper Collins. New York: 1992.